Graduating high school or college is one of the greatest achievements in an individual's life and should be recognized. Celebrate and reward their achievement with some of these gifts that have been specially selected by our staff to honor those during the graduation season. The Pewter Dome Paperweight is a great office decoration for any lover of history of the US Capitol Building or anyone interested in pewter gifts and pewter items. This US Capitol pewter paperweight is 4-1/4 inches tall and 2-1/2 inches wide and weighs over 1 pound. 58th Presidential Inauguration Pen Set makes an excellent addition to your office or would make a great gift for anyone wanting commemorate this special event. This the Official Pen and Key Chain of the United States House of Representatives. This elegant Pashmina wool scarf is adorned with traditional Yoshino cherry blossom branches in full bloom. Pashmina is a fine type of cashmere wool. A beautiful, vibrant addition to her spring or summer wardrobe. Our colorful George Washington bobble head stands 7 inches tall wearing a blue, white, and gold uniform with scabbard. Our hand painted ceramic trinket box is a great keepsake for collectors of United States Capitol souvenirs. Our stylish John F. Kennedy dark brown leather billfold wallet has plenty of places for cards, photos and pockets in the back for bills. No one wore sunglasses like Jackie, and the accessory became central to her iconic style. This particular style, typical of the legendary Jackie "O" era, need no introduction! 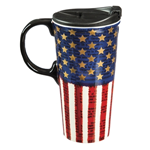 Show your love for your country with this special desk accessory! 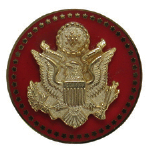 This beautiful pewter and glass paperweight houses a color-filled medallion bearing the Great Seal of the United States on it. Our bright finished pewter pencil cup is adorned with a confident looking cast pewter crab and will keep all of your writing utensils organized. This handsome pewter pencil cup with eagle medallion is great container for hold your writing utensils. The pewter pencil cup makes a wonderful gift for graduates, government employees, members of the military, veterans, or anyone who truly loves the United States. Jackie wore this watch while at the annual RFK celebrity tennis tournament. Jackie was a fixture at the tournament which was established for charitable giving. There Jackie attracted huge stars such as Mohamed Ali. 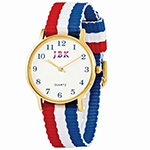 This wonderfully casual watch would be perfect for a Independence Day picnic! Invest in the right pair of sunglasses that embellish casual American confidence. 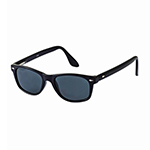 Our John F. Kennedy Black Color Rhodium-plated accent Sunglasses are timelessly cool with laid-back sophistication. 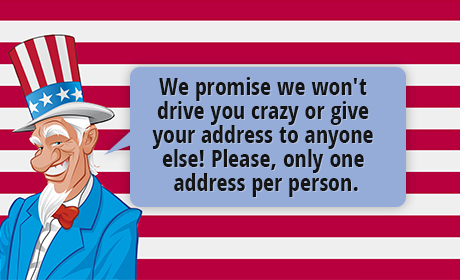 Show your appreciation for our country with Capitol Dome desk accessories! This fine pewter letter opener handle is adorned with a cast replica of the dome of the Capitol building in Washington, D.C. This is a wonderful gift for graduates, government employees, history buffs, and anyone who loves our great nation's Capitol. Our pewter eagle letter opener makes a beautiful and practical gift for executives and administrative assistants alike. This letter opener would be particularly useful in businesses which have a high volume of mail to be opened. Beautiful Cherry Blossom Quilted Tote Bag with multiple pockets inside and a magnetic button closure. Bag measures 17 1/2" wide, 15" tall and 7 1/2" guesset. Marble replica of the dome of the United States Capitol. Capitol dome is made from the marble of the east front steps that has been ground to a fine powder and molded into a decorative desk or shelf accessory. Boxed with provenance information on base. Made in America. This coin set will make a great gift to any American patriot or coin collector (or both). 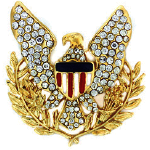 The pentagon-shaped coin has the six seals of the U.S. Military on it while the Great Seal coin features the Great Seal of the United States on one side and the other side is The Pentagon. This pen was handcrafted from wood carefully saved from trees which were planted at Mount Vernon by George Washington. This exclusive desk accessory gift includes a Mount Vernon certificate of authenticity numbered and signed by the craftsman and also by Mount Vernon�s Executive Director. A great symbol for all the success our recent graduate will endure on the next phase of their professional career. 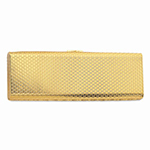 This handsome, unique money clip adds a distinguished flair to all mens accessories collections. George Washington played one of the most critical roles in the struggle for American freedom. As commander in chief of the Continental Army, president of the Constitutional Convention, and first president of the United States, Washington was known for his resolute honesty, courage, and devotion to his country. This posthumous portrait of President John F. Kennedy by Aaron Shikler was painted in 1970 and now hangs in the White House Entrance Hall. Print comes with a gold frame. The John F. Kennedy Framed art print is approximately 14 1/2" x 18 1/2". If you are a Kennedy fan then you must have this famous art print. 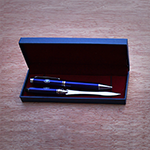 A great gift for anyone, this pen set comes in a stylish, laser engraved wooden box. On the cover of the clamshell-style box is a great, laser engraved representation of the White House flanked by the words "Barack Obama - 57th Inauguration - January 21, 2013" and in smaller letters below that "Made in USA".